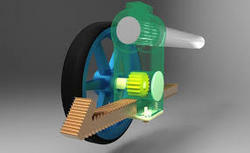 We are your one-stop solution for specialized CAD services in the domain of mechanical engineering. Our technological expertise can meet your requirements ranging from 2D CAD Drafting, 3D CAD Modeling, CAD Designing to Animation and Walkthrough. We believe in partnering with clients to provide affordable business solutions. We provide you CAD services in India for your core areas of business that meet international standards. Enabling product manufacturers to comprehensively develop design information from their conceptual ideas, we provide design and drafting solutions for mechanical components and industrial equipments to meet shop floor requirements. At Designit4u, our engineering team assists manufacturing organizations to leverage their capabilities through required manufacturing information using 2D manufacturing drawings as per the shop floor requirements. Considering the criticality of design parameters, our CAD professionals ensure flawless design communication with accurate GD T and BOM details. Our engineering design facility comprises of high performance workstations and industry leading CAD tools such as AutoCAD, Inventor, SolidWorks and Pro-E to swiftly handle large volumes of data. In addition, our design team includes experience drafters, mechanical engineers and certified CAD professionals to provide error-free solutions as per industry standards. Having delivered design and drafting solutions for diverse industrial domains, Designit4u has a proven track record of successfully completing complex design projects within expected turnaround time. We offer flexible engagement models with strict compliance to non-disclosure agreement to meet manufacturer specific requirements and cost structures, allowing better control over product design and development process. Looking for “CAD Design Drafting Services”?